Perennial herb or shrub, up to 2m heigh, native to South Africa (mountains of th Western Cap Province); leaves obovate, tips curved backwards; flowers solitary in leaf axil, small, white to purplish; fruit a five-parted capsule. 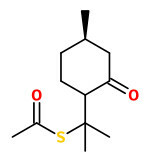 P-menthane-8-thiol-3-one was identified as a specific odor-determining ingredient of buchu leaf oil. GC and GC-O analysis of 16 black currant juice samples showed that several commercially available products contained Buchu oil to improve aroma, without any such indication on the label. Buchu oil is used because its constituent 8‐mercapto‐p‐menthan‐3‐one has a catty odour that is similar to the catty odour of black currants. As retention times of the two odours are different, sniffing the effluents of the gas chromatographic column is a way to detect the addition of Buchu oil. The qualitative sensory evaluation of the thiolacetates give strong and fruity odour impressions (trans-compounds more intensive than the cis-isomers). The essential oil of A.betulina showed antimicrobial, anti-inflammatory (5-LOX) and cytotoxic activity.